In 1856 three families arrived and settled on the south bank of the Cottonwood River near a site which overlooked a fall in the river. 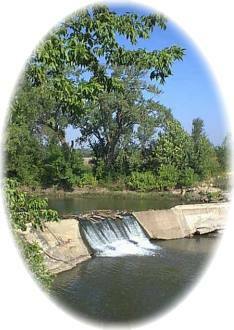 This site was to become the city of Cottonwood Falls. In 1859 Chase County boundaries were redefined and Cottonwood Falls was designated as the county seat. Prospects for Cottonwood received an early setback when it was bypassed by the Santa Fe Railroad in 1871. The depot, located 2 miles North was first called Cottonwood, but in 1881, it and the community which grew up around it were named Strong City. This "twin city" situation led to one of the states first interurban systems. Horse car service between the two towns began in 1887 and this courthouse square was the southern terminus of the 2-mile railroad. In 1918 the company converted to gasoline-powered motor cars, but the track that served well for horse cars could not handle the heavier and faster equipment. Improved technology in this instance only created difficulty, and in 1919 the interurban ceased operations. Swope Park consist of 30 acres and includes the Municipal Swimming Pool, Chase County Fair Grounds, Shelter Houses, Lighted Athletic Fields and Playground Equipment. Listed on the National Register of Historic Places in 1985, the area at the Cottonwood Dam is a place to enjoy watching the fishing for catfish on the bridge. Stop and listen to the relaxing sound of the falls. North of the river is Bates Grove Park which offers picnic facilities. The Roniger Brothers, Frank and George, were born in Highland, Madison County, Illinois. They came to Chase County, Kansas, in 1885. The museum was built to house the Roniger collection of Indian artifacts and other Chase County historical articles and artifacts.